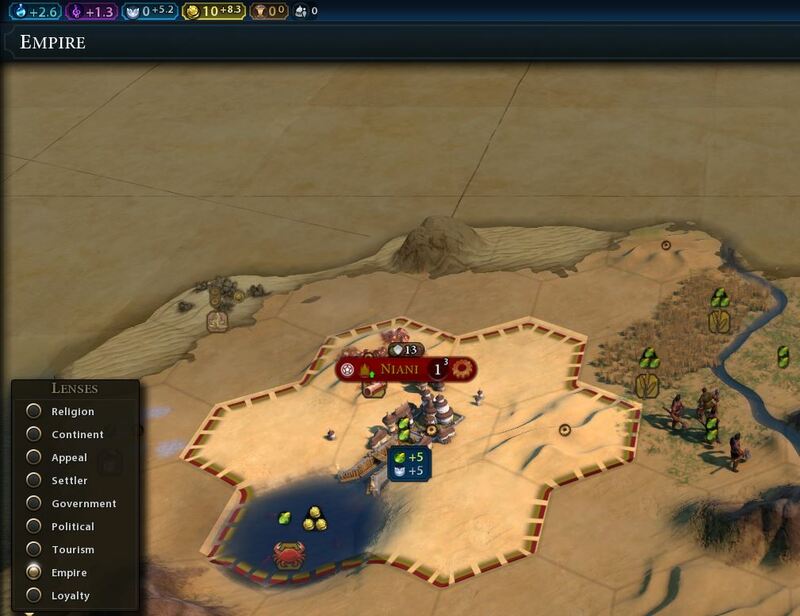 Songs of the Jeli- Mansa Musa not working? Discussion in 'Civ6 - General Discussions' started by JasTiger, Feb 19, 2019. I'm looking at my desert cities and they are supposed to have 1 faith, 1 food for every adjacent desert. I go to citizen view and they have 0 output of food or faith, and the city center isn't generating any either. Is this a known glitch with Songs of the Jeli? Also are Suguba's supposed to get 2 gold for EVERY adjecent river tile or just one? Songs of the Jeli worked fine at my games with Mali. Do you habe a screenshot? Suguba gets the adjacency bonus for a river one time no matter how many adjacent river tiles, just like normal commercial hubs. I can grab one when I get back home, I'm away from the game right now. By chance did you build districts in the adjacent hexes? In some cities they are built NEXT to the blank desert tile, in some there are districts or improvements ON the tiles. I don't see how that would matter as even if its a district, its still a desert tile and its still adjacent to the city center. Yeah, I get that too but am wondering if there's some undocumented stipulation like that. Districts did not decrease the desert bonus for me. It works (looking at the city summary, you can see the food and faith production totals), but you won't see it on the tile yields looking at the citizen management view. An easy way to tell is by using the empire lens. It'll display the district adjacency and yields above the tiles. I'd report that as a bug with pictures for proof. Images of the cost in cities with and without the Suguba + the oddball CH would help. I've heard over a couple places that repairing some uniques doesn't restore addition effects. However, I've never had it happen in any of my games (to my knowledge). Interesting for sure. Where exactly did you hover your mouse, I couldn't find that. And yeah you can see on the map it isn't there. You have to kinda guess at it. Thats weird. Plus, how do we know that faith isn't from a policy card or a trade route? One of my Mali cities had buildings that were more expensive to buy but I couldn´t figure out what the problem was. But the Sugaba was indeed affected by a flood but the discount did not reappear after repairs! I did not connect the two. You can use the new Empire Lens to check the adjacency bonuses for districts. I think that's what you're seeing in the screen shot. I have and thats where i became alarmed and first noticed that I wasn't getting the bonus resources. So I hopped in and you guys were right. Looks like its centered on the city center, so the yields don't show up on the tiles next to them but on the city themselves. Slick! Can confirm. Several of my suguba were flooded in my last game, and the purchase discount did not return after repair. Turrdy and kingofsealand like this.